Remove and replace everything. Set toys which are broken or no longer used aside. Use your broom, vacuum cleaner, or dusting cloths. Children learn while having fun. For circle time, change children's usual spots. If you use different colors for each child, mix up the colors throughout the theme. Change their places for lunch and naptime too. Scramble your words when you are speaking to the children (example: Hungry you are? Time lunch for now!). Ask children to help you unscramble your words. During this theme, we will pay close attention to how objects are stored. Remove and replace everything. Set toys which are broken or no longer used aside. Use your broom, vacuum cleaner, or dusting cloths. Everything must be in order or disorder. It's up to you to decide! Use illustrations to identify your workshops (Open illustrations - workshops). 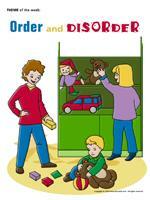 (Open activity sheet - Order and disorder) Print for each child. The pictures may be used as a memory game or to spark a conversation with the group. This week, the picture game is related to the various activities which occur during a regular day at daycare. You may display it for children to identify which activity will be next. This helps many children feel secure. (Open Tools - Visual routine) Print, laminate, and store in a "Ziploc" bag or in your thematic bins. 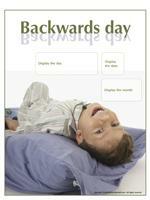 (Open perpetual calendar - Backwards Day) Print for each child. Ask children to attend daycare with their clothes on backwards. Greet children with your clothes on backwards too. Greet them with, "Good evening my friend!" Scramble children's names. During circle time, sit back to back. Walk backwards. Throughout this special day, have children brush their teeth prior to eating. Why not begin lunch with dessert? Change children's places for naptime. Sit in a circle with your group. Hold a deck of cards in your hands. Ask them if they want to play a game of pickup. At the same time, throw the deck of cards up in the air. Children pick up the cards. When they are done, have them sort the cards by color or kind: hearts, diamonds, spades, clubs. Have a toy storm. Gather as many toys as possible and deposit them in the center of the daycare. When you give them the signal, children must put everything away before the storm blows everything away. Use a vacuum cleaner to represent the storm. Deposit tiny objects such as blocks, buttons, pompoms, crayons, small figurines, etc. on the floor. Have children sit in a circle and remove their socks. The object of the game is to pick up as many objects as possible using their toes and drop them into an empty container. Have fun sorting objects by shape, size, color, materials, etc. 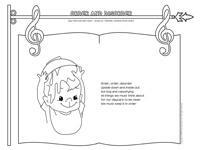 Deposit several boxes throughout the daycare and glue illustrations on them to help children associate objects to the correct category. Divide the group into two teams. The first team leaves the room. The other team changes five objects within the daycare. For example, they may put a cushion on the floor, change a clothing item on one of their team members, place an item upside down, etc. When the first team returns, they must find the five differences. Change teams and continue the game. In your construction area, provide children with plastic containers, empty cardboard boxes, etc. They will enjoy building castles with the recycled material. You may also ask your local grocer for cardboard boxes. Let children play with the boxes, following their imagination. They will spend hours building tunnels, houses, towers, and structures of all kinds. When children tire from renovating, have them tidy the boxes or invite them to use them to store toys until their next renovation session. We all have a cupboard full of plastic containers. Let children play in it, making it as messy as they want before placing the containers back in an orderly fashion. Choose identical objects (for example: a pair of socks, 2 clothespins, 2 buttons, 2 mittens, 2 forks, 2 crayons, etc.). Put all the objects in a large box and ask children to find all the pairs. This is a simple way to teach children to sort certain objects. Present children with an assortment of jars, approximately 6 to 8, of different sizes. The goal of this activity is to find the correct cover for each jar. This is excellent for stimulating classification abilities. For older children, add a jar and cover which do not belong together. This makes the exercise more difficult. Children may also sort the jars from the smallest to the biggest. Provide children with various arts & crafts material (feathers, pasta, buttons, bits of paper, stickers, etc.). Ask them to make a collage using a series of objects, from the smallest to the biggest. Blindfold children and invite them to draw.